Universal Central Battery - Series CBM - Signtex Lighting Inc.
Computer based, self-testing/self diagnostic emergency lighting equipment operating MOONLITE LED™ fixtures and exit signs with all components addressable and integrated throughout, allowing precise monitoring of unlimited numbers of fixtures in multiple locations. Status reports are available on demand from any location via internet through a cloud-based server. A wide range of fixtures with specialized optics is available for interior and exterior applications. Automated diagnostics and fully addressable fixtures combined with easy access to batteries and long lamp life ensure the lowest possible life cycle costs. Automatic monitoring and self-test diagnostic functions supplied as standard, including battery condition, transfer switch, battery charger and emergency fixture load. Optional network includes addressable fixtures. Data transfer via ethernet through a cloud- based server. All diagnostic data is available via internet based cloud server, with automatic reporting of all central battery systems in multiple buildings. Installations with full network controls allow two-way communication and monitoring via internet of unlimited quantities of central battery panels and fixtures throughout multiple buildings, from any location.Standard display includes multicolor diagnostic status LED and Push to Test switch. Optional LCD display provides full operational data on two-line digital display including battery voltage, charge current, load condition, fault monitor and fault description, panel temperature, charge current, date stamp and other information. Optional installed printer will produce complete status and history reports on demand. Two standard 12V SLA (Sealed Lead Acid) batteries supply a minimum of 90 minutes of emergency power from 100 to 1,000 watts at 24 VDC. Batteries are readily available for commercial distributors and can beremoved and replaced in minutes, without ladders, lifts or special tools. Battery capacity and fixture load combinations can be adjusted to supply emergency power for longer periods, as required. Specialized optics produce elongated beam patterns which increases spacing and reduces the total number of fixtures required to illuminate the path of egress. A wide range of fixture types and models is available, covering many combinations of interior and exterior lighting requirements, from floor level to ceiling heights of 40 ft or higher. See www.signtexinc.com for details. Guaranteed minimum LED life to 70% output in 50,000 hrs provides lowest life cycle costs over a building lifetime. LED driver circuits are equipped with two independent power inputs, allowing both emergency and optional night (normal-on) lighting operation. LED exit signs have high brightness and uniformity with power consumption of 2 watts. 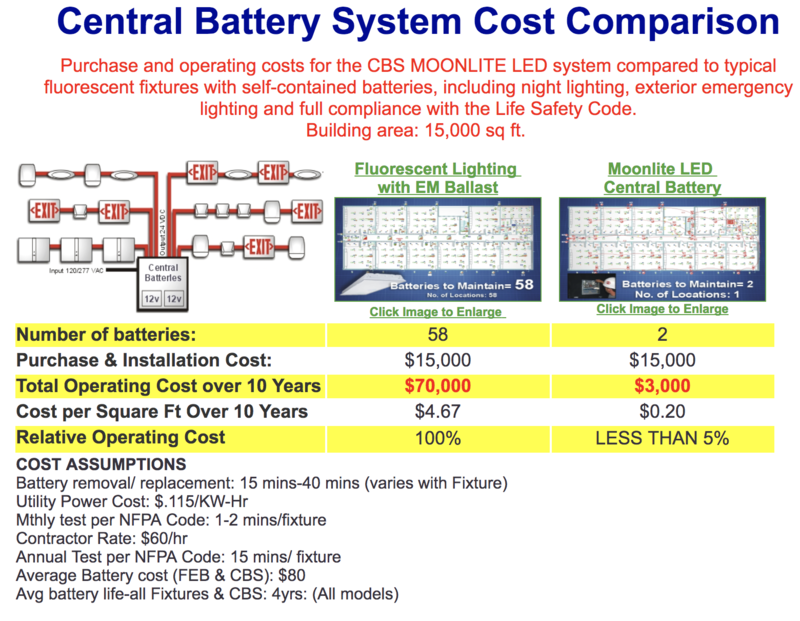 An overview of the Central Battery Systems & Moonlite LED. Includes a list of the services we offer & some selected projects. This guide will step you through the specification process. Includes initial model selection, load calculations, & circuit layout. Fill out & submit for factory layout & design assistance. Frequently asked questions concerning the Central Battery System. Includes sample circuit layouts & risers. Demonstrates the tremendous advantages of the Central Battery System. An introduction to the Central Battery System and the full line of Signtex products. CBS vs. conventional emergency lighting.